In a past Spotlight, I wrote about the efforts of the Consumer Horticulture Team to simplify the process by which consumers can submit samples of their soil for testing to get an accurate assessment of soil quality for their lawns or gardens. The result was a soil test self-mailer. 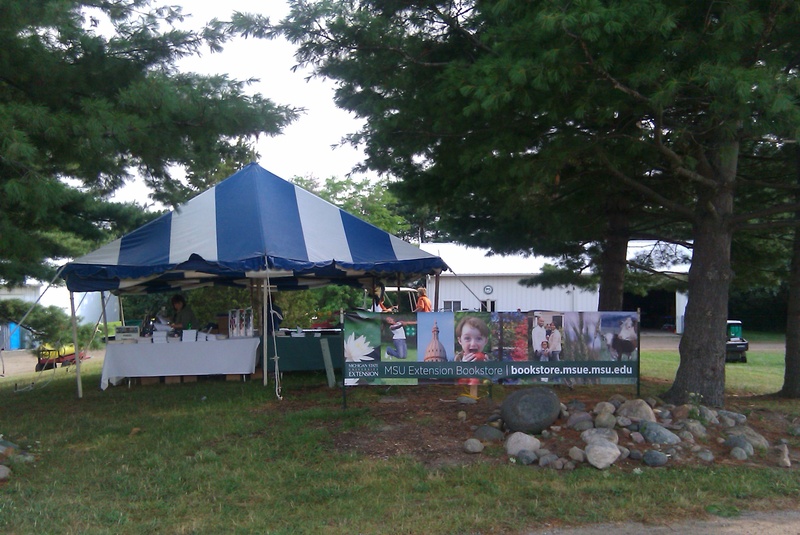 Now, thanks to the hard work and creative efforts of the soil test team, the new Michigan State University Extension’s Home Lawn and Garden Soil Test Mailer (E3154) is now available through the MSUE Bookstore. Past kits handled lawns and veggies only. These new kits, strictly for homeowners, include all home and garden uses – lawns and veggies as well as trees, shrubs, annual flowers, perennial flowers or fruit. I want to thank the soil test team for their diligence in bringing this product to fruition. Back in 2006, Mary Wilson led an effort in MSU Extension Oakland County to increase staff efficiency, decrease turnaround time for soil-test customers and create consistency between counties in the soil-testing process. Of course, the main goal remained to protect water quality while helping people grow healthy plants. At that time, large counties would receive 600 to 800 homeowner soil tests to interpret. Mary submitted a regional Project GREEEN grant proposal to develop a related soil test website. Funded in 2007, website production involved Mary, Jeremy Lounds (the current programmer), Kevin Frank and Ron Calhoun. The Oakland County soil testing initiative led by Bindu Bhakta generated hundreds of homeowner soil samples. Consumers turned their samples in at local garden centers. The soil test team includes Bindu Bhakta, Bert Cregg, Jon Dahl, Rebecca Finneran, Kevin Frank, Mark Longstroth, Jeremy Lounds, Cheryl Peters and Mary Wilson. Jennie Stanger and Allen Krizek were involved with the project before they retired. Bindu Bhakta became project leader in 2009, keeping the project moving and on track. Under her leadership, the project received additional funding from two MSUE PREF (Program Recovery Funds) grants for development and implementation. Both Bindu and the soil-test team members took this on in addition to their regular tasks, developing the soil test self-mailer and completing work on the MSU Soil test website so it could develop custom recommendations for home lawn and garden soil samples. How does the soil test kit work? Customers order a kit online from the MSUE Bookstore at http://web2.msue.msu.edu/bulletins2/product/soil-test-kit-selfmailer-1116.cfm. The cost is $25. The kit contains everything a home gardener needs to submit a soil sample for testing to the MSU Soil and Plant Nutrient Laboratory (SPNL). SPNL will analyze the sample and contact the customer through email. The email will contain a direct link to the MSU Soil Test website where the customer can view his or her fertilizer recommendation and any necessary pH modification instructions. Customers without email or Internet access will receive printed copies of their personalized recommendations from the SPNL. Counties may also order soil test mailers to sell through their offices. Thank you to all who made this project possible. With creative use of technology, our staff worked together to come up with an efficient solution. Raising chickens in the backyard is becoming a popular activity. And as you can guess, people who are attempting the venture are in need of some professional guidance. Michigan State University Extension specialist Darrin Karcher recently taught a class on raising backyard poultry at the MSUAA’s (MSU Alumni Association’s) Lifelong Education Evening College. The Evening College offers personal enrichment courses to MSU alumni and members of the community. The September 2011 issue of the Council for Advancement and Support of Education (CASE) Currents magazine featured the class in the article “Backyard Egg-stravaganza.” CASE is an international association of educational institutions. More than 30 people took the course that included three weeknight lectures and a field trip to the MSU Poultry Research and Teaching Center. The class was one of the most popular of the semester. Last year, Darrin received the Poultry Science Association’s Early Achievement Award for Extension. He co-authored the MSU Extension bulletin E3136, “Suggestions for Ordinances Allowing Backyard Poultry” along with Paul Wylie, retired Extension educator, and R.M. “Mick” Fulton, avian pathologist with the MSU Diagnostic Center for Population and Animal Health. You can download the bulletin as a free PDF at the MSU Extension Bookstore: http://bookstore.msue.msu.edu/. 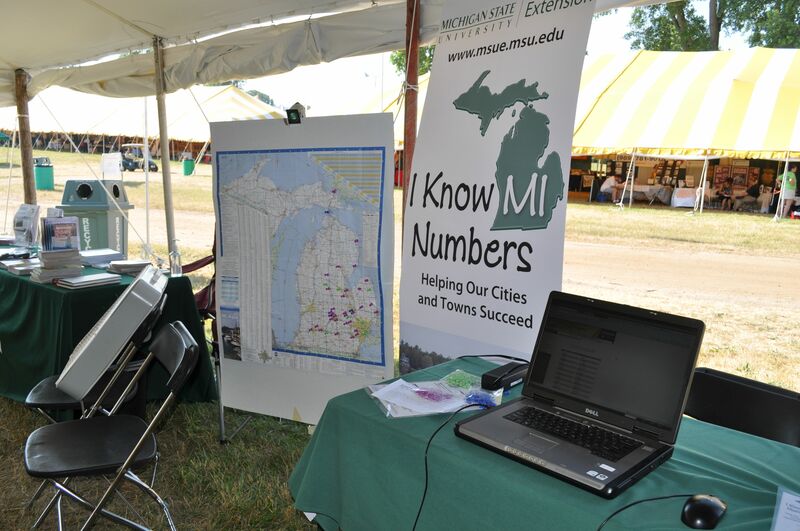 As you know, Michigan State University Extension is implementing the I Know MI Numbers initiative, focusing on five targeted programs among many identified as critical to the state’s future on Gov. Rick Snyder’s dashboard. 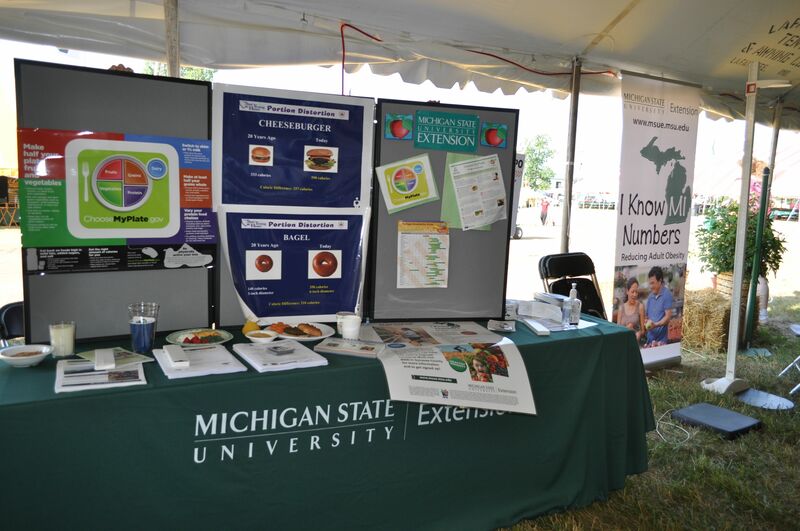 MSU Extension staff members educated the public about each issue in the College of Agriculture and Natural Resources tent and the MSU Extension Bookstore tent at Ag ExpoJuly 19–21. In temperatures in the 90s with humidity that led to heat indexes in the 100s, our dedicated staff soldiered on to encourage attendees to improve their quality of life. 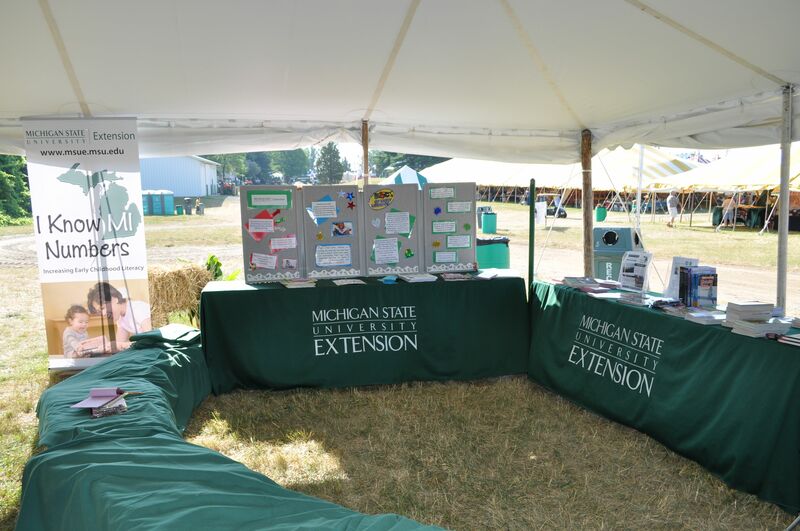 At the MSU Extension Bookstore tent, Ag Expo attendees could purchase soil test kits. The kits make it easy for gardeners to get quick results and information when they send in their soil samples through Extension to the MSU Soil and Plant Nutrient Lab. Mary Wilson, MSU Extension consumer horticulture educator and state coordinator of the MSU Extension Master Gardener Volunteer Program, was on hand in the CANR tent to explain the process. Using the soil test results, gardeners can more accurately determine the amount of fertilizers and herbicides to use – lessening the chance of overuse. This would reduce runoff, improving water quality – a goal of the I Know MI Numbers targeted program: Agriculture That Protects Michigan’s Waters. We’d like to see Michigan’s water index moving higher than 88, on a scale of 100. (If you missed getting a soil test kit, you can still get one at the MSU Extension Bookstore at bookstore.msue.msu.edu.) Staff involved with the water quality initiative staffed a display at the CANR tent as well. And during Ag Expo, many demonstrations throughout the three-day event focused on agriculture that improves water quality. We have nearly 60 programs or events throughout the state that focus on key water-quality issues. Agriculture That Protects Michigan's Waters exhibit. Photo by Katie Alexander. In the CANR tent, Extension staff members measured visitors’ height and weight to help them determine their BMI (body mass index). Staff members were ready to talk nutrition and healthy habits with attendees. Reducing adult obesity is a targeted program that aims at reaching 8,000 people across the state to make healthy changes in their behavior. In Genesee and Saginaw counties, 35 adult obesity prevention/reduction classes reach hundreds of adults with information to help them improve their BMI. Reducing adult obesity exhibit. Photo by Katie Alexander. Helping Our Cities and Towns Succeed aims at helping local officials address the fiscal crisis and reduce the cost of government. 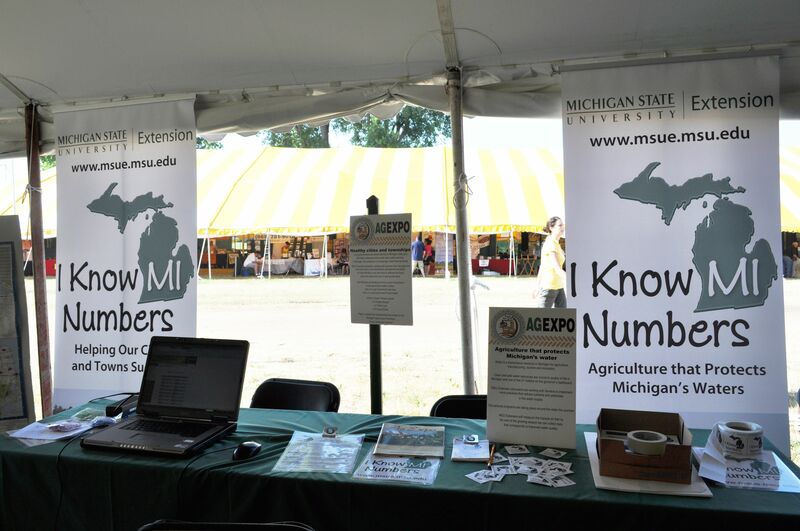 Michigan residents attending Ag Expo could determine their local fiscal health number (by checking a chart on the Michigan Department of Treasury’s website, created by MSUE) and compare it to other communities. They then placed a colored tack on a map that represented one of three categories: neutral, watch or stress. The goal of this targeted program is to have all communities fall in the neutral category, a number between zero and four. Extension is partnering with the governor and the Michigan Department of Treasury to educate Michigan residents about fiscal health. Helping Our Cities and Towns Succeed exhibit. Photo by Katie Alexander. Increasing early childhood literacy focuses on Michigan children entering kindergarten with the skills they need in order to be reading at grade level by the third grade. In the CANR tent, a children’s story hour took place every hour. After listening to the story, a child could choose a free book to take home. MSU Extension has held five events since June in which children and parents focused on developing pre-reading skills. And we’ll be distributing up to 500,000 books donated by First Book to youth living in low-income situations. MSU Extension is helping to improve science literacy by supporting teachers with resources, experiments and lesson plans that align with Michigan Science Education standards and coordinating 4-H Science Blast and 4-H National Youth Science Day. Kids who attended Ag Expo participated in two water-quality science experiments and the Fashion-a-Fish project activity to improve their own science literacy. Improving Science Literacy exhibit. Photo by Katie Alexander. 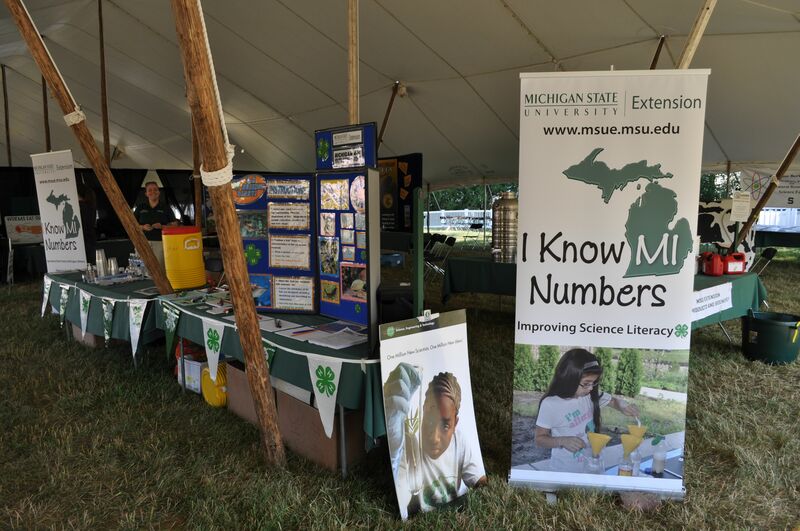 Thanks to all who participated in making it possible to get the word out about the I Know MI Numbers initiative at Ag Expo. Consumer Hort Team delivers a (proven) winner! I was impressed to see the rollout of the new soil test self-mailers during this week’s MSUE Redesign call. The idea is to simplify the process by which consumers can submit samples of their soil for testing to get an accurate assessment of soil quality from their lawns or gardens. Currently, a consumer needs to pick up a soil test envelope from the county office, place a soil sample into the envelope and then drop it off at the county office along with payment for the test. We have not had a standardized price for soil tests, so some consumers with a load of soil tests to submit would shop around among our county offices to find the ones that charged the least amount for their tests. Now, thanks to the Consumer Horticulture Team in the Agriculture and Agribusiness Institute, we have a standardized soil test envelope that can be purchased for a standard price of $20 either from the county offices or online from the Michigan State University Extension Bookstore or from retailers that choose to market the test envelopes. The envelope is already addressed and has postage applied that will ensure shipment directly to the MSU Soil and Plant Nutrient Lab on campus. Then the results will be made available to the consumer either through an email with the specific results, or if he or she wishes, through the county office. The emailed results will link to a website that gives more information on products the consumer may want to use and application rates for their situation. The Consumer Horticulture Team also previewed a new 1-800 hotline that will be staffed as a call center to address questions that consumers have about gardening, lawn care and other horticultural matters. The hotline will also address questions that come via email to a central email address or through the Ask an Expert application on our website. It’s great to see our colleagues challenging themselves to develop a statewide system for addressing horticultural information needs of consumers, and the results are very impressive. I’m looking forward to seeing the other innovations they develop as they meet the challenge of helping us to create the Cooperative Extension system that Michigan needs in the 21st century and doing so with limited resources. Thanks to the entire team for their leadership and drive to innovate! Comments Off on Consumer Hort Team delivers a (proven) winner!